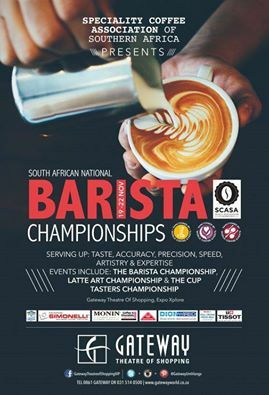 SCASA National Competition 2015 gives you the start of the National Competition 2015 with The Coffee mag at the Gateway Theatre of Shopping VIP. From 19-22 November the best of the best coffee professionals in South Africa will take part in the Barista, Latte Art and Cup Tasters Championships. Wishing ALL the baristas the best of luck! Here is a list of all the contestants that made it through to the SCASA National Competition 2015 in Durban. To watch these guys in action click on the link below. Our amazing organising team have put together the detailed schedule for Nationals, so take a look below at who’s competing when.